One of the largest business networking events in Northern Michigan is organized by the Boyne Area Chamber every year. 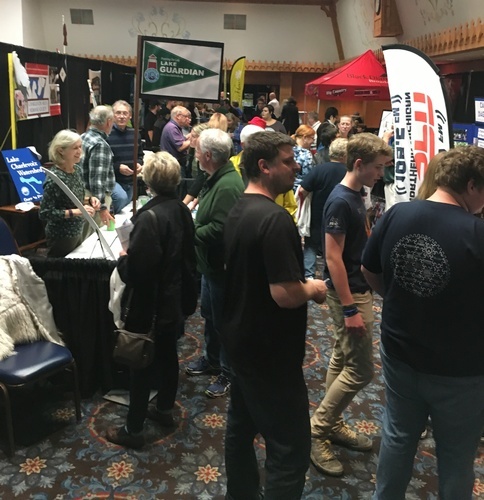 This is the 10th annual Business Expo and Taste of Boyne, and will include about 75 exhibitor booths and a crowd of more than 1,000 people attending. This exciting event includes great food, networking, music, business exhibits and more, from 3 to 7 p.m.
> The public and Chamber members are welcome to attend. Admission is $5 and includes all Taste of Boyne booths. > Complete list of more than 80 exhibitors. New this year! Mini Workshops! Chamber member businesses will offer free, short (30 minutes or less) workshops throughout the duration of the Expo, between 3 and 7 pm. See below for full list of confirmed workshops. A brief review of the estate planning tools available to you. A discussion about what you should have and what you don’t need. Concluding with a Q & A session. Conflict is inevitable. It is a part of Life. How we handle conflict is what makes the difference. Get some tips on how to address and resolve conflict in the workplace. Hiring and retention tips and resources small business owners can use to build and keep great teams. Top 5 tips in both hiring and retention will be discussed along with resource references for tools to help implement them. 20-minute prevention followed by a Q & A session. Why should you own it? Why should you rent it? How to choose the right property. How to buy it right. Financing options. Life these days depends on the internet but most rural areas don’t have access to it – until now! Truestream, powered by Great Lakes Energy, is a new high-speed fiber internet and phone network coming to rural areas starting this fall. Great Lakes Energy members will be eligible for the service which will offer internet speeds faster than cable or other providers. Learn about Truestream’s construction plans, service offerings and how you can support the efforts to bring faster fiber internet to your neighborhood. Learn more at jointruestream.com. FHA, PMI, 1003, DTI, and LTV? The mortgage industry is full of acronyms and its own vocabulary which often times sounds like a different language altogether. Next time you explore home financing, go into it feeling confident, empowered and educated! In this workshop, we will cover the following topics in hopes of reducing the overwhelmed feeling often brought on by starting the mortgage process: Mortgage programs overview, mortgage vocabulary explained, do's and don't's of the mortgage process, and tips for a smooth mortgage transaction, followed by a brief Q&A session. Returning to college as a working adult can be intimidating. Let us help you with the process. A representative from Spring Arbor University will share information about credit transferability, financial aid including grants available and accreditation. The session will conclude with information about degree completion programs SAU offers here in Northern Michigan. Those on the journey to retirement face many risks that have the potential to throw even the savviest investors off-course. Learn about five common challenges retirement investors face. Take time now to review and understand them before your journey takes an unplanned detour. Investment products and services offered through CUSO Financial Services, L.P. (Member FINRA/SIPC) are: Not insured by NCUA/NCUSIF or otherwise federally insured • Not guarantees or obligations of the credit union • May involve investment risk including possible loss of principal. Learn what it takes to write the prefect press release that will get noticed by the paper. Also what is newsworthy and will get you in the newspaper. Bring your questions! This workshop is mostly interactive. Admission is $5 per person, which includes a Taste Card for all food booths.